I'm a lady who loves her cocktails, but lately I've been getting bored with my typical choices. I usually stick to two options; wine (mostly rosé), or vodka & lemonade (Natalie's strawberry lemonade if I'm feelin' fancy). Since that's not cutting it for me anymore, I decided to put my Pinterest board Cheers to the Freakin' Weekend to good use. No time like the present to browse those 121 pins that I never utilized. 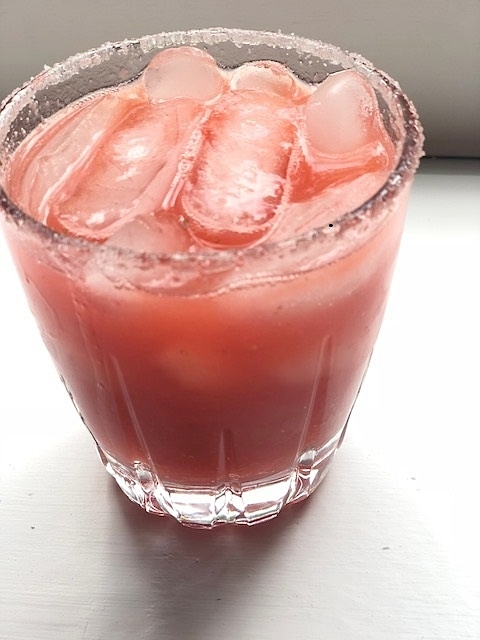 I came across a delicious looking strawberry margarita recipe, but I didn't have all the ingredients. Being as though I did have quite a bit of Deleón tequila that wasn't being used, I decided to concoct my own recipe. For some reason, I didn't have high hopes, but I ended up being pleasantly surprised. It was so refreshing and not overly powerful. If I had to give an honest opinion, it was definitely the best margarita I've ever had, and I'm not just saying that because I made it. Start by blending your strawberries until liquefied. Combine all remaining ingredients with blended strawberries and mix well. Garnish the rim of your glass with sugar (or salt, if you'd like), add ice and enjoy!